Much of the partnership between female and male emperor penguins is spent apart, like long-distance lovers. But if they can, the same female and male pair will re-mate every breeding season. 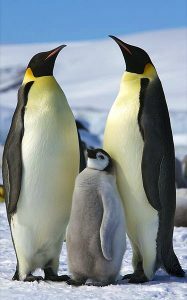 For budding relationships, the male emperor penguin will try to court a female in a showy fashion. How do emperor penguins win over female emperor penguins? To set the scene: Male and female penguins are all gathered on the thick ice in a large group. Males are calling out to their mates, every bird is walking around; it’s a crazy time. For un-mated males, they will create a display to try and attract female attention, much like us humans do. There are a bunch of combinations of how males try and court females but it will usually include swinging their heads side to side, raising their flippers and heads, and/or doing a fancy walk. If a male seems particularly impressive, a female will face the male and they move their bodies together in sync, mirroring each other. Each female will only produce one egg per year with the same partner, so they’ve got to make a good choice the first time they decide to mate. Update: an earlier version of this article included a photo of a king penguin.